One-string Canjo Kit - a fun, easy-to-play instrument that you build yourself! Vintage tennis racket guitar. 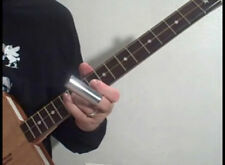 2 corde, si suona con lo slide come una lap steel Guitar. Bellissimo suono tipico delta blues. The design is dialed in, and they are a solid product. So here you go. It is built into the amp - no need for a separate unit/cable. Made from a small cigar box. Treated with my Beat to Sh! Looks beat up on the outside, but the box joints have been re-glued for added strength. Ciao Amici, Ia Cigar Box Guitar in vendita è la "M-13 3S. - Corde n. 3, (b-d-a) per elettrica. - Spessore mm 20 5 tastiera. - misure manico: larghezza mm 30. - Diapason mm. - Ponte in acciaio brunito temperato. You are ready to rock! This explains why there are so many varieties of whisky. The original design and specific scale length of these guitars give them a unique sound and temper. This will add to your sound arsenal and take you to new musical heights! Cigar Box Guitar U.S.A. R66 3SP delta blues special Robert Matteacci's. My cigar box guitar arrived this morning. It is beautiful and il sound very good. I am very satisfied. Hy Robert ! La cigarbox è molto bella! Ora speriamo mio figlio gradisca (e si dedichi al blues.). Segret Society Cigar Box Guitar delta blues special Robert Matteacci's. Ciao Amici, Ia Cigar Box Guitar in vendita è la "Segret Society 3SP. ". My cigar box guitar arrived this morning. It is beautiful and il sound very good. I am very satisfied. Sono molto divertenti e facili da suonare, basta poco per poter entrarci in confidenza con il loro sound delta blues. Cigar Box Guitar Delta Blues 3SP. Potete vedere le demo di queste Cigar Box Guitar sul canale you tube: - Robert Matteacci Cigar Box Guitar. La cigarbox è molto bella! Ora speriamo mio figlio gradisca (e si dedichi al blues.). Per ora è il bassista dei Plunk Extend. Cigar Box Guitar Jack Daniel's 3SPV delta blues special Robert Matteacci's. My cigar box guitar arrived this morning. It is beautiful and il sound very good. I am very satisfied. Sono molto divertenti e facili da suonare, basta poco per poter entrarci in confidenza con il loro sound delta blues. Cigar Box Guitar mod. 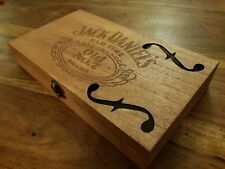 Jack Daniel, 4 corde, pick-up piezoelettrico tasti medium. Le corde hanno una altezza comoda per poter essere suonata con il bottleneck oppure con le dita. Persona davvero affidabile, simpatica e alla mano. Un artista! Ciao Amici, Ia Cigar Box Guitar in vendita è la "EL MUNDO S.P. ". Hello Friends, Ia Cigar Box Guitar for sale is the "EL MUNDO S.P.". Sono molto divertenti e facili da suonare, basta poco per poter entrarci in confidenza con il loro sound delta blues. Ciao Amici, Ia Cigar Box Guitar in vendita è la "Harley Davidson 3 S.P. ". Hello Friends, Ia Cigar Box Guitar for sale is the "Harley Davidson 3 S.P.". the total length cm 82. The handle has a 630mm scale. Cigar Box Guitar mod. 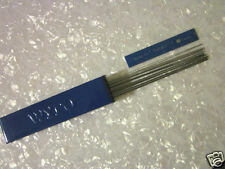 MACANUDO, 3 corde, pick-up piezoelettrico tastiera slide. Ciao Amici, Ia Cigar Box Guitar in vendita è la "Macanudo S.P. ". Cigar Box Guitar mod. Gallettes, 3 corde, pick-up piezoelettrico tastiera slide. Potete vedere le demo di queste Cigar Box Guitar sul canale you tube: - Robert Matteacci Cigar Box Guitar. È amplificata con un pick-up piezoelettrico. Tastiera Slide, i tasti sono disegnati. ALCUNERE CENSIONI. Ideal für den Originalen "Deltablues Sound" und "Bottleneck Slide". Leute wie Seasick Steve, Shane Speal oder Justin Johnson zeigen wie es geht. auf der Gitarre sind Nagelneue 011er Saiten aufgezogen, also Kabel rein und los gehts, clean oder verzerrt. Indian Great Chief 3SP Cigar Box Guitar delta blues special Robert Matteacci's. Ciao Amici, Ia Cigar Box Guitar in vendita è la "Indian Great Chief 3SP. ". My cigar box guitar arrived this morning. It is beautiful and il sound very good. I am very satisfied. Sono molto divertenti e facili da suonare, basta poco per poter entrarci in confidenza con il loro sound delta blues. My cigar box guitar arrived this morning. It is beautiful and il sound very good. I am very satisfied. Hy Robert ! Ho una De Lucia. Lunghezza totale cm. Persona davvero affidabile, simpatica e alla mano. Cigar Box Guitar La dolce vita by Matteacci's. Potete vedere le demo di queste Cigar Box Guitar sul canale you tube: - Robert Matteacci Cigar Box Guitar. La lunghezza totale cm 82. Vantano appassionati e cultori in tutto il mondo. È amplificata con un pick-up piezoelettrico. Campbells'3SP tomato soup Cigar Box Guitar Robert Matteaccis'. Mod: C.B.G. Campbells'. - Robert Matteacci Cigar Box Guitar. My cigar box guitar arrived this morning. It is beautiful and il sound very good. I am very satisfied. Hy Robert ! - Capotasto in ottone. Cigar Box Guitar Krumiri , 3 corde, pick-up piezoelettrico tastiera slide. 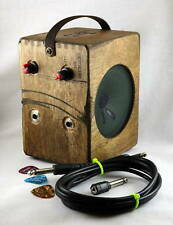 Great for use with an electric cigar box guitar. Solid, thick walled finger jointed cigar box. 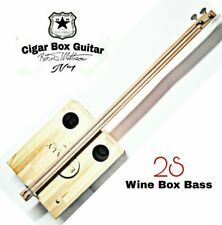 Great for amplifying a cigar box guitar with a stomp box, microphone (hamonica, singer), used as a 2 mic PA system, with a traditional electric guitar, or whatever. Potete vedere le demo di queste Cigar Box Guitar sul canale you tube: - Robert Matteacci Cigar Box Guitar. - Mod: C.B.G. Delta Blues. La cigarbox è molto bella! Ora speriamo mio figlio gradisca (e si dedichi al blues.). My cigar box guitar arrived this morning. It is beautiful and il sound very good. I am very satisfied. Le corde hanno una altezza comoda per poter essere suonata con il bottleneck oppure con le dita. 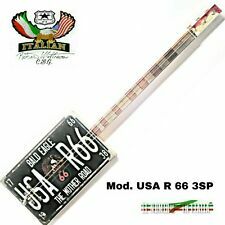 Ciao Amici, questo modello in vendita è la Cigar Box Guitar Plasmon numero 300. La cassa è in metallo originale dei Biscotti plasmon vintage degli anni 50. Pickup single coile tipo precision. Il manico con tastiera con tasti medium ha una scala da 630mm. Ha un buon volume in acustico e un potente suono elettrico. Per vedere le demo delle Cigar Box Guitar da me realizzate vai sul mio canale you tube: Robert Matteacci Cigar Box Guitar.Sito internet www.robertmatteacci.comPagina Facebook:Robert Matteacci Cigar Box Guitar Italia. Matteacci's Cigar Box Guitar mod. Effe Acustic 3SP vintage. Potete vedere la demo di questa Cigar Box Guitar sul canale you tube: - Robert Matteacci Cigar Box Guitar. Lunghezza totale cm 82. Persona davvero affidabile, simpatica e alla mano. Un artista! È settata per poter essere suonata con lo slide oppure con le dita. Zigarrenkiste-Akustikgitarre mit 4 Saiten. Elektro-Akustik Zigarrenkisten-Gitarre mit 4 Saiten. - Farbe: Cask Burst. - Mahagonihals mit Halsstab. The hardest-to-find tools to get you started fretting! The neck features a glued-on poplar fretboard with zero fret with a wooden string retainer. The frets has been end-dressed and should be ready for use, though of course you can always smooth things down even more if you prefer. "Southbound Katy" 3-string Fretted Cigar Box Guitar - Old Railroad Postcard Art! A beautiful, easy-to-play acoustic-electric guitar! 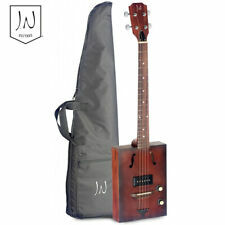 Complete Cigar Box Diddley Bow Kit - easily build a one-string cigar box guitar! Camel Trophy Cigar Box Guitar 3 corde, pick-up piezoelettrico, tasti medium. Potete vedere le demo di queste Cigar Box Guitar sul canale you tube: - Robert Matteacci Cigar Box Guitar. È amplificata con un pick-up piezoelettrico. Persona davvero affidabile, simpatica e alla mano. Ciao Amiche e Amici, questo particolare mandolino l'ho realizzato con una bella scatola di sigari Romeo y Julieta. Ha una buona sonorità in acustico ed è amplificato con un potente pick-up piezoelettrico. Trovate la demo sul mio canale youtube ROBERTMATTEACCI. 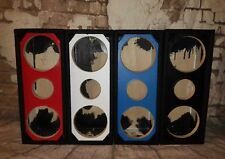 C. B. Gitty Records Box Set - includes 5 Cigar Box Guitar albums - a $70+ value! 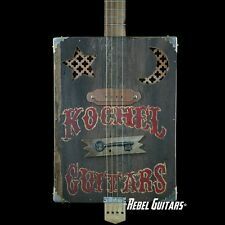 Some of the best cigar box guitar music being produced! My cigar box guitar arrived this morning. It is beautiful and il sound very good. I am very satisfied. Hy Robert ! Francesco L. Persona davvero affidabile, simpatica e alla mano. Un artista! La cigarbox è molto bella! Potete vedere le demo di queste Cigar Box Guitar sul canale you tube: - Robert Matteacci Cigar Box Guitar. ALCUNERE CENSIONI. Schallloch: Zwei Löcher, mit synthetischer Holzabdeckung. - Decke: Sapele. Cigar Box Gitarre. - Farbe: Cask Coal. - Hals: Mahagoni, mit Spannstab. The guitar is acoustic/electric with a single coil pickup. The body of the guitars are shaped from antique wood salvaged from torn down turn of the century buildings. Spent bullets serve as fret markers and the nut is hand-shaped from the bone of Montana elk and bison.